The October 2015 schedule changes continue the implementation of new Service Standards on many routes. One major change is related to construction activity: Coxwell Station bus loop will close to allow construction of the new elevators making this site accessible. While the work is in progress, the 70 O’Connor and 22 Coxwell routes will be joined into one service. 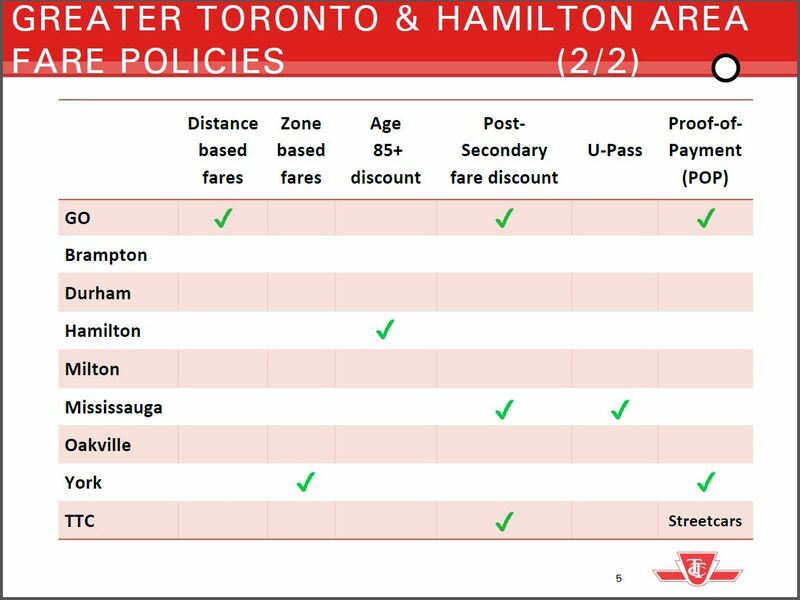 Updated on September 24, 2015 at 1:45 pm: The TTC has clarified a few points about its table of fare policies. The text of this article was updated to reflect this. At its meeting on September 28, 2015, the TTC Board will receive a staff presentation on the principles to be used for evaluation of possible fare systems. At this point, specific changes to fares are not up for debate, but staff seek direction from the Board on where to focus their analytical efforts. An important table comparing fare options across the GTHA is included in the report. Pass-based fares including the monthly discount program fall into a separate category of “loyalty programs”. This chart drives home the fact that 2 hour time-based transfers are common in the GTHA while distance-based or zone-based fares are comparatively rare. Such a chart should have been part of the recent Metrolinx Fare Integration report, but it was not, potentially misleading the Metrolinx Board about the relative prevalence of GO’s world-view on fare structures. Demand exceeds peak period capacity on some routes. By implication any fare structure that drives up demand will only worsen this situation. Revenue control. The TTC does not entirely trust that any new fare system will yield the same revenue. Complex fare and transfer rules. Within Toronto, the transfer rules make integration with other fare systems difficult if not impossible. However, these may be offset somewhat through other improvements such as system-wide proof-of-payment and Presto rollout. A timeline shows how various features of a new fare system would be implemented. 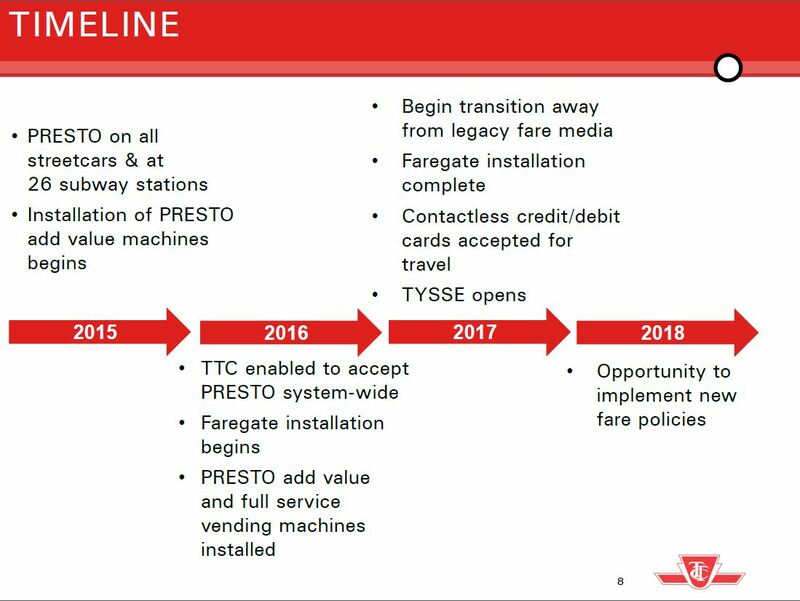 Note that a move to support a wider range of cards beyond Presto is timed for 2017. 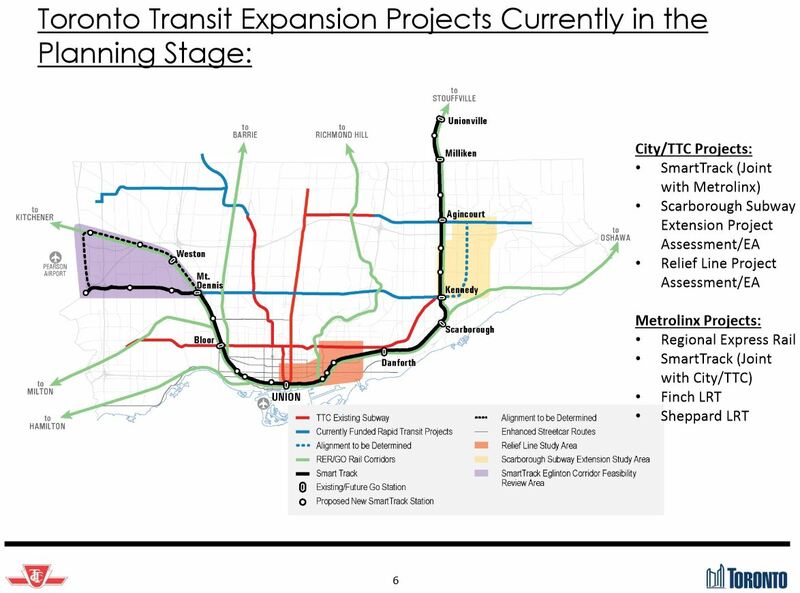 This date is part of the Presto plans, as reported at the recent Metrolinx Board meeting. An essential change in the Presto model is that all of the fare handling logic moves to the “back end” of the system and the card (or some equivalent such as a SmartPhone app) merely provides a rider’s “credential” saying “this is me” to the system. Such a change makes possible a much richer set of fare integration and loyalty programs because a rider’s travel can be accumulated over time (much as a phone bill is) and the appropriate rates and discounts applied after the fact based on usage. Underlying the analysis will be the assumption that new fare policies would not be implemented until 2018 when the technology underpinning would be in place. There is an expectation that the price gap between cash fares and Presto would widen relative to current practice as this is already the case in other parts of the GTHA. Notable by their absence in this list is a discussion of service classes such as premium express fares and any scheme in which the “rapid transit” network would be a separate fare tier. Also included on a regional basis will be considerations of low income discounts and fare equity as well as co-fares. The analysis will come back for debate and endorsement by the TTC Board at its December meeting. Metrolinx has released details of its daily ridership counts. Although they claim via Twitter that ridership is going up, when the numbers are actually graphed, this is not true. The projected ridership rising from 3,000 per average weekday to 5,000 over the first year of operation (blue). 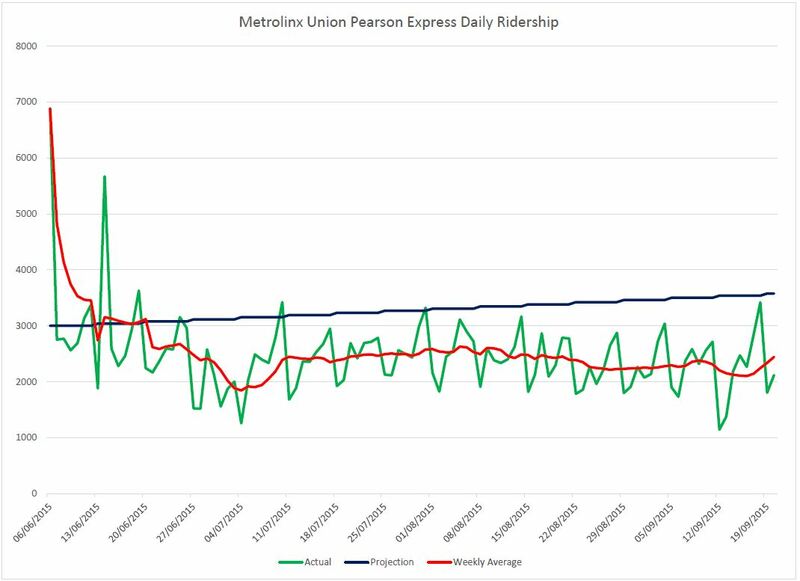 The actual ridership from the Metrolinx stats (green). The moving average weekly ridership (red). For the first six days, these are the values for the operation to date. It is quite clear that the ridership has settled into a regular pattern after a dip in early July. There is little evidence of a Pan Am Games effect on the numbers. As and when Metrolinx releases additional ridership data, I will extend this chart. What is missing from the Metrolinx data is a statement of the average fare paid and a breakdown by fare type. This would reveal both the nature of ridership and the effect, if any, of promotional fares on demand. In my first article reviewing the TTC’s budget updates of September 15, 2015, I looked at the Capital Budget for 2016 and the ten-year plan out to 2025. This installment looks at the Operating Budget including proposals for fare increases and service improvements. The TTC has responded to questions I posed to clarify some issues raised by this article regarding: ridership, revenues and costs for Pan Am Games operation; treatment of capital-from-current related to bus purchases in 2015 and 2016; contract service changes for York Region; and diesel fuel hedging savings. See the end of the article for details.